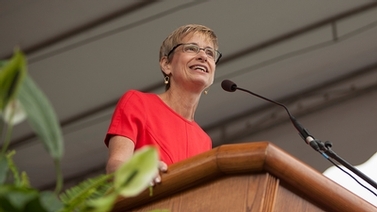 ELIZABETH GARRETT: So I want to just give you briefly, before I introduce our terrific honoree today, the five goals of entrepreneurship at Cornell, and I'm sure many of these you've seen during the day. To increase funding and faculty leadership in our entrepreneurial activities. 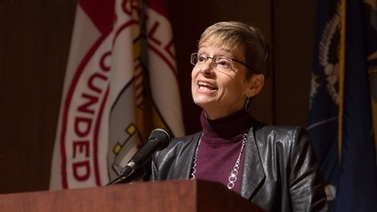 Two, to achieve a higher rate of commercialization for Cornell research, including more startups. I told you a little bit about what we're already doing. 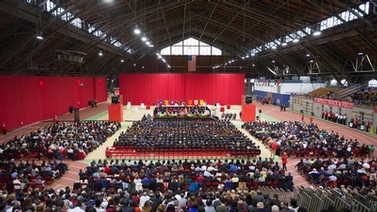 We were also looking for a new lead for our Center of Technology Licensing, and what we're going to do is try to bring some of the new ideas that we're seeing generated at Cornell Tech, at Weill Cornell, and in some places in the Ithaca campus, and make sure all of those ideas are available to all of our students and faculty. We want to lead in thinking differently about how we can bring our work out into the world, and we're very excited about that. We also recognize that technology doesn't have a narrow definition. It can include software code hosted in the cloud and downloadable. So we're very excited, and the other thing I would say about our IP, we also have amazing IP out of the School of Agriculture and Life Sciences. I don't know if you guys know this, but we have created more than 278 new varieties of fruits and vegetables, and we receive as a university about $1.5 million a year from all of the new, primarily apples, that we produced. So it's something that not very many of our peer schools have as a way of thinking about entrepreneurship. I would say thirdly, we want to increase diversity in entrepreneurship. Relatively few women and African-Americans are in entrepreneurial activities. 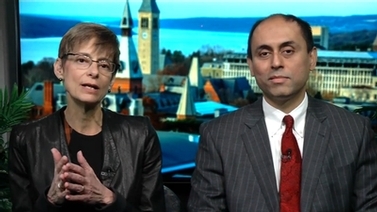 How can we as Cornell help address that? I think one way we're doing it, and I saw this in the last speaker, is to think about ways we encourage more women and minority students to go into entrepreneurship. Our Rev has a program for women called Passenger to Pilot that was recently recognized by the Small Business Association. 15 women entrepreneurs are participating in this, and we're helping, I think, provide role models for this segment of our population who can succeed wonderfully in the startup world. We will also be sponsoring a conference on women in February. One other kind of diversity we've focused on is in the Hotel Administration school. We have a boot camp for veterans who want to be entrepreneurs. Number four, we want to increase research about entrepreneurship and bridge theory and practice. I gave you two examples of that. That kind of scholarship, that kind of research, is being produced all over our campus. 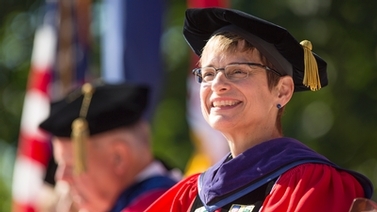 And we'll begin to think of our campuses, all three of them, as ways to study how we bring work out into the world. And then fifthly, we want to encourage businesses to stay in our upstate area where economic development is much needed. As I've mentioned, we have Rev. We're part of the Southern Tier Startup Alliance. And we will continue to make the case that upstate New York is a terrific place to begin a business. As Macchiavelli said, obstacles and opportunities are not so very different, and we will turn both to our advantage. 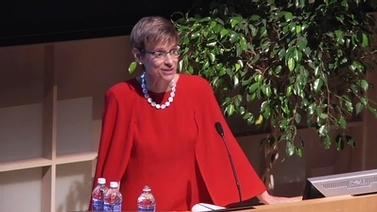 Cornell University President Elizabeth Garrett speaks at the fourth annual Cornell Entrepreneurship Summit NYC on Nov. 6, 2015. Business leaders shared insights about their successes and challenges at the daylong conference, "Erase the Edge," hosted by Entrepreneurship at Cornell. Learn more about Cornell’s academics, mentors and campus resources that help support entrepreneurs to innovate.